From its inception, Fiddlesticks Country Club has been a rare jewel in southwest Florida and a wonderful place to call home. Comprised of approximately 600 households, every resident is an Equity Member with an equal interest in the pride and care of this treasure. The club is member-owned, operated and debt free. Fiddlesticks is a community you can count on now and for generations to come. Fiddlesticks provides its members with a full range of amenities; the best that private country club living has to offer. An elegant new Fitness Center offers personal training, massage, a variety of classes, even on-site physical therapy in conjunction with Lee Memorial Healthcare System. Eight Har Tru tennis courts offer a variety of programs for all ages and playing levels; a junior Olympic pool and children’s playground are adjacent.The dining rooms at Fiddlesticks are always busy, a testament to Chef Joe’s culinary expertise. Members enjoy casual dining on the balcony, intimate formal dining, and a variety of social events. Among the top-ranked courses in Florida, Fiddlesticks’ original course, the Long Mean, is a Ron Garl design. It was named early on as one of Golf Digest Magazines’ Top 100 Golf Courses in the USA. The 7,077-yard, par 72 Long Mean inspires players through its challenging course design and breathtaking beauty. The second championship golf course, the Wee Friendly, represents very different challenges, with sparkling lakes in play on two-thirds of its holes. With two 18-hole courses and only 600 members, Fiddlesticks members have the opportunity to play every day, year-round and they may own their own golf carts. Members love the easy access to the courses; tee times may be made online or with a simple personal phone call to the pro shop. Playing times average well under four hours and with many year-round members, it’s easy to get a match even out of season. The golf program is helmed by Jim Kurtzeborn, Director of Golf, who has attained Master PGA Professional status. In 2010, Fiddlesticks was chosen to host southwest Florida’s first USGA championship, the Senior Women’s Amateur. The club is also home to several USGA qualifiers and the 2007 and upcoming 2012 Society of Seniors tournament. $81,000 due in full to club upon closing – 80% refundable ($64,800) plus 25% of any increase in equity fee when you sell. All food and beverage (including alcohol) purchased from the snack bar, club social events, a la carte dining (breakfast, lunch, dinner), private parties and carry out are included. Tournaments are not included. You can contact the HOA directly at (239) 768-1113. Check out my Gated Community Resource Guide that includes detailed information about Fiddlesticks Country Club. Contact me for more info about this beautiful community! 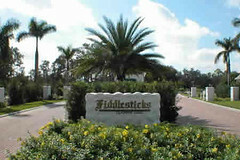 You can also view all current homes for sale in Fiddlesticks Country Club. Posted on March 28, 2013, in Real Estate and tagged Buy a Home, Buyer, Championship Golf Course, Equity Membership, Fiddlesticks, Fiddlesticks Country Club, Fort Myers, Golf Digest Magazine, Har Tru, http://www.kristenpell.com/, Jim Kurtzeborn, Kristen Pell, Lee Memorial Healthcare System, Master PGA, PGA, Property Guiding, Real Estate Biz, Realtor, Ron Garl, Senior Women's Amateur, SWFL Real Estate, USGA. Bookmark the permalink. Leave a comment.